Top Ten Tuesday - Disneyland Rocks Edition! 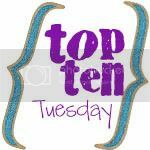 This is my first Top Ten Tuesday post hosted by Amanda who blogs at Oh Amanda. Because we just got home from an awesome weekend at the Magic Kingdom, the Disneyland Resort, I decided it would be fun to do a post on it! Without further ado here are my Top Ten Reasons Disneyland rocks. 1. 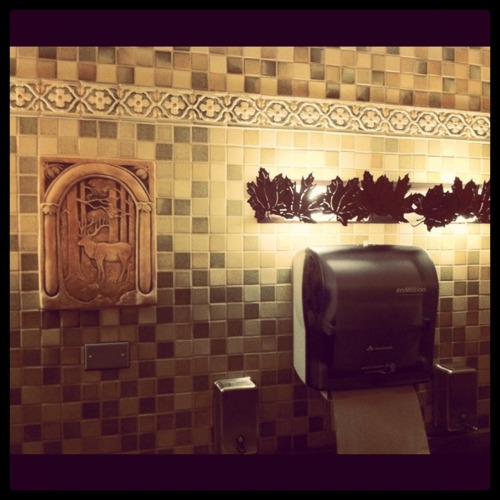 The bathrooms are decorated in the theme of the "land" they are in. For example, the picture was taken in Critter Country and I thought it was great! 2. The employees are not called workers, they are Cast Members. 3. The Cast Members uniforms go with the area they work in. 4. Mickey's sillouette can be seen on lots of things. Most memorable location is the Mickey-head bolts in the entryway of Disneyland/California Adventure that surround the trees. Lots of food items have Mickey's head on them too! 5. All of the lines are themed and have snippets of ride trivia making them endurable to stand in. 6. The FASTPASS! What a great way to cut the lines. 7. Live bands that are incredibly talented, especially Billy Hill and the Hillbillies at The Golden Horseshoe. 9. At least one bathroom in every "land." They're not more than a 3 minute walk apart. 10. They are always improving on their parks. If something doesn't work they scrap it and add something that does. It makes us all want to visit Disneyland/California Adventure often to see the new things they've added.